Has a lot of static in the intercom, and it has a lot of wind sound when at speed. Expected a lot better out of Sena. Decent gear but, I will not replace with same. The range is surprisingly limited on clear flat ground. Even riding two up the sound can get very screechie. The mike will not work with Siri unless you set Siri up at highway speeds with the bike running. Otherwise it’s useless. Easy to install. Fairy easy to set up. You just have to pay close attention to how you sequence the link up between units. The price is extremely high for basically a walkie-talkie. I’ve had my set over a year and the battery life is down to about 5 hours on intercom. The set has been a good first set. My next purchase will be a lot better though. I bought these as a temporary solution as the Sena SRL2 headsets are on order (not released yet). These are excellent and have great features for the money. I have a loud 2018 Ducati XDiavel with an aftermarket pipe, and you cannot tell when I am standing next to it revving it up or riding at 50 mph. Phone calls are clear and easy, and headset to headset (intercom) is clear as well. The buttons are easy to use, and pairing was simple. It auto-connects to my phone instantly when turned on. I cannot believe that when I call someone (by voice dialing) while riding in town or on the highway (full face helmet) that the other party cannot tell that I am on the bike. My only gripe with Sena products is that you cannot mute the microphone which means everyone hears you cough, sneeze, talk to someone at a red light, sing, mumble... as you are riding. The only way to prevent this is to disconnect from them which means that you can't hear them if they try to talk to you until you reconnect. My Chatterbox from 2001 could mute the mike and so can the Sena 30 series, so why not any others (not even the new SRL2)? 5 stars for product quality and features, 3 stars for no mute (do they use their own products?). Great value for a basic coms system that does everything it’s supposed to well. I have had them for a month now and using them as helmet to helmet only on ATV's. i purchased them because they had a good rep and per specs a good range. my 3 acres is only about 600ft max depth and only 500ft max riding depth between users at any given time. the land is pretty flat and only thing in between is a house. so relatively clear. also no wires over head and all underground utilities so doesn't seem like i have much that should interfere with the signals. the specs say 400 meters (about 1200ft) for intercom to intercom. after 300ft-400ft max it gets static and after 400ft you cant make out what the other person is saying. 500ft it disconnects from the other user until we get closer again. and that is with full charge. other annoying part is that they dont stay paired. you have to re-pair them every time you turn them on. i cant find any auto connect for intercom to intercom. not sure if that is even an option on any of these types of units but still annoying. beyond that the sound quality is great. my daughter and i can understand each other fine even over the sound of our quads and wind. and install was simple enough. pairing is simple process and battery life is good. used them for 5 hrs on average before i try to charge them and at that point they are not dead. i give them a 3 mainly because of the range issues. when it advertises 1200ft and i barely get a 1/3 of that. Installation was fairly straight forward and there is enough kit to find the best set-up for you and your helmet. Sound clarity was excellent when riding close but did fade after maybe 200 meters and even a group of cyclists seemed to interfere a little so i don't think it would be suitable for large gaps. For my needs ( my wife and i ride separately) its perfect and yet to fully explore all features. Bought this for my husband and self for our long trike rides. Not being very tech savvy I was not sure of what to buy, but I made a great choice in this product. It was easy to set up and with just a little practice we were communicating through our helmets in minutes. So glad I bought this. this set does exactly what its intended to do .my buddy and i rode the whole day and were able to maintain constant contact.haven't learned all of features yet (like music sharing ),but solo rides with music are great.overall an awesome deal. I based my decision to purchase this item and found that it is in fact a great buy. It is exactly what I was expecting for listening to music and communicating on phone and intercom. I highly recommend this product. We took a 6 day 1500 mile trip around our home state of Colorado and purchased these units specially for this trip. These units worked flawlessly. The intercom was crystal clear and my ear was talked off the entire trip lol. Answering the phone was a breeze and the caller had no idea I was on the bike. Sound clarity for the music is good but as others have said it lacks bass, no big deal. The units come paired and paring with your phone was simple. I'd say they are good for up to 30' we however are on the same bike. Installation was simple, first helmet took a couple hours second one took 30 min once I figured out what I was doing. The boom mics just got in the way so I used the wired mics. I put my wife's behind her cheek pad and put mine inside the lining just above my forehead. For some reason hers picked up a lot of wind with it in the same location. We are so happy with these units hope this helps with your decision making. Have fun, ride safe and watch for the idiots. I need an economical system I can use to communicate with my girl friend while riding and to listen to my cell phone/GPS and this one seems to fit the bill. I am a new rider and the price was right for starting out. Since my wife is a very new rider I wanted to be able to be in voice contact when we go for a ride. It's a good affordable way to communicate with your riding buddy. Good performance for the price. Great value. These work great and give a good option for communicating with a passenger without breaking the bank. Just wanted to listen to music and talk with my wife while touring around and this was a good compromise between cost and features. I don't need to connect to 10 different riders, its mostly just my wife and I or a buddy or two that ride around. This fit my needs at a sweet price for a dual pack! I was looking for something simple to talk to my wife on the back. The price was also a deciding factor. I've heard great things about this and at this price couldn't pass it up. I am a first time user and i did not want to spend big bucks untill I try this set up. If its as good as reviews I will update to the top of the line of sena products . It had good reviews and looked like it will do what I want. Great price, easy setup. Love these. 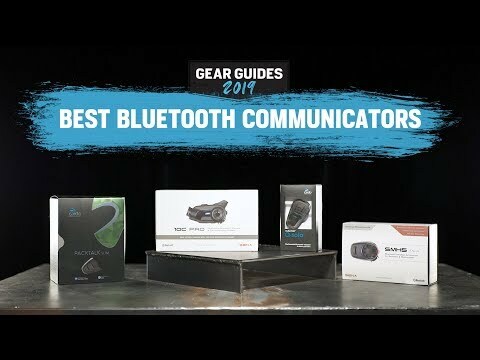 I was looking for a great quality wireless intercom/blue tooth phone, mainly for riding with the wife. The Sena SMH5 had everything I was looking for. Revzilla had it for the best price, no tax and shipping fees, and with upgrades and features not offered on other sites. Economic for kid's helmet and compatible with my SMH10R. However, be aware that the SMH5 can only intercom one-on-one. It can be paired with three additional Sena communicators, but can only speak with one of them at a time. Sena's good name and reputation. best deal for the money! While sharing music with the passanger , will the GPS sound be shared too ? smae for incoming calls if using one Iphone. Does this Bluetooth intercom install in full face helmets? BEST ANSWER: Yes! I have one in a full face and one in a modular. I will eventually install one in an open face as well. The boom mics that come with it will work in any style helmet. absolutely. comes w 4 mics- 2 for full face and 2 for open face. Can u have 3 people on a call? BEST ANSWER: I haven't tried that yet but I believe you can. 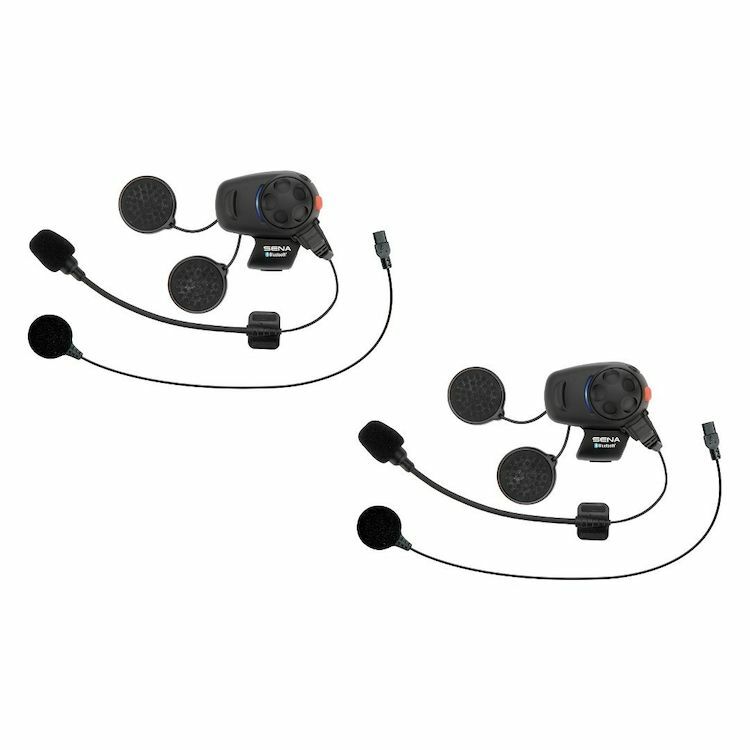 You can certainly link to multiple headsets using the intercom. Is this product compatible with 2017 Harley boom box? BEST ANSWER: No it’s not. Can this be used on half helmets ? BEST ANSWER: I don't think so, I believe Sena makes a half helmet unit. around a horse arena. What are the types of plugs at the input (microphone) & output (speaker)? BEST ANSWER: The speakers and mic cable all combine into one plug that goes into the unit. They seem to be very proprietary to these units, or at least to Sena products as I've never really seen one like it. Same goes for the plug at the end of the mic cable for the mic. It's pretty much a one off. Neither are any form of USB from what I can tell. for driver to passenger communication, do you need a cell phone? BEST ANSWER: No cell phone need to just talk to each other. Cell phone would only be for music, GPS, phone calls. Yes, if I remember correctly each unit can be paired to up to 8 others. Is this 2 units or 1? BEST ANSWER: This is two units. I installed them on two different helmets and they work fantastic! How do they work when 2 people are on one bike? I have had issues with another model/make they work great on 2 different bikes but up close they do not just want to make sure. It is two complete units. Don't forget to do the software update as well for each. Does this set have everything needed for 2 helmets ( 2 full systems)? BEST ANSWER: Yes everything to do 2 helmets and also enough extra Velcro to put the headset into a new helmet when/if you get one.